Are you searching for the best Instagram plugins to display photos in WordPress? If so, you’ve reached the right place. We love both WordPress and Instagram. They can help each other to boost your website traffic and expand the network. Insert your Instagram photos in posts, pages or sidebar to encourage your readers to follow you on the photo-sharing site which will result in growing your page visits. Know How to Automatically Post New Instagram Photos to WordPress. In this post, we’ll show you the 10 best Instagram plugins for WordPress to showcase your stunning photos and videos to attract your audience. Start with the Instagram Feed. It is an awesome plugin to display Instagram photos from any non-private Instagram accounts in WordPress. You can show photos from multiple accounts either in a single feed or in different feeds. Instagram Feed comes with an attractive, responsive layout and mobile-ready optimization. The plugin is customizable in terms of width, height, number of photos, number of columns, image size, background color, image spacing and more. It allows you to insert photos into posts, pages, widgets using a shortcode. Instagram Feed is a great tool to regularly update your readers with the latest photos and increase social media engagement. 10Web Instagram Feed is another Instagram plugin to add responsive photo gallery in WordPress. It is user-friendly and easy to set up. The plugin lets you display Instagram social feeds, photos, video feed in posts and sidebar widgets. The feed can be displayed from public Instagram accounts or based on hashtags. It uses 4 layouts for smaller and larger displays along with user metadata like bio, the number of posts and followers. You can create as many as Instagram feeds and they will be responsive, SEO-friendly too. 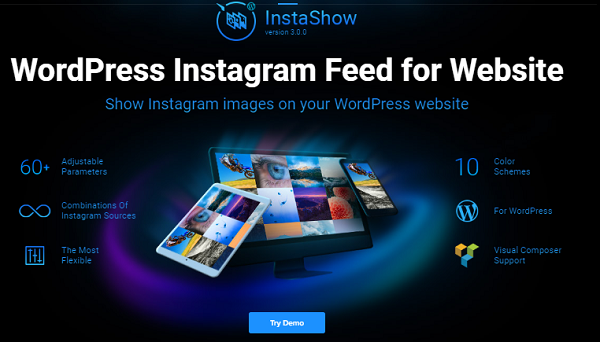 InstaShow is a highly-customizable premium Instagram plugin for WordPress. It allows you to display Instagram photos from unlimited sources using usernames, hashtags, locations, and photo URLs. This CodeCanyon plugin serves ultra-responsive photos with 10 color schemes and two-slider and grid-layouts. You can customize their size and, limit the number of columns and widths as you like. InstaShow contains two post templates and you are able to display just the images or the post info with call to action buttons that allow users to perform a targetted actions while browsing. You can show both videos and image carousels in infinite scrolling with the plugin. 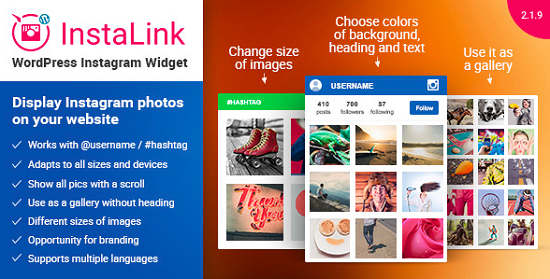 WP Instagram Widget is a simple Instagram plugin exclusively for sidebar usage. It will help bloggers to showcase their latest Instagram pictures in the sidebar of the blog. Just set your Instagram username, the number of photos to display, image size, link target, and link text. That’s it. The plugin is ready to use now. Do you want to impress visitors with beautiful slider images? Here’s the solution. Instagram Slider Widget lets you show images from a public Instagram account or from a hashtag in slider or thumbnails. As an admin, you can customize the image links, sort order, number of images and refreshing frequency. A slider widget can show 12 latest images from a user account or up to 18 images from a hashtag. 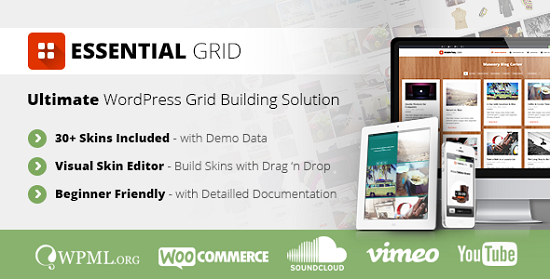 Essential Grid Gallery is an allrounder grid building solution for WordPress. It is a great tool for the business websites with exceptional features that can be used to display various content formats like images, Instagram, YouTube, Vimeo, portfolio, sliders, and others in beautiful grids. The plugin is packed with more than 30 skins and examples to quickly create grid galleries that you need. InstaLink is a premium Instagram plugin to showcase photos on your website. It is responsive and user-friendly tool to efficiently promote your Instagram account among the audience. You can filter photos by username, hashtag, and username with hashtags, to show only those images relevant to you. Resize, beautify images and display them in the sidebar of your website to raise your popularity. Feed Them Social is a popular social media feed plugin for WordPress websites. It is a perfect tool to display photos and videos from your Instagram, Facebook, Twitter, Pinterest, YouTube and Vine accounts. The site owners can create an unlimited number of social feeds and insert them in posts, pages, and sidebar. Customize the feeds, font colors and let readers share your Facebook, Instagram, Twitter feeds among their followers. AccessPress Instagram Feed is a simple Instagram plugin to display your Instagram post images in mosaic, slider layouts. It has an interactive user interface and delivers fully responsive, mobile-optimized contents to the viewers. There are three different modes for the feeds- Normal, Slider and Lightbox. It features 3 design layouts and you can use either a slider or shortcode to showcase images. It is an awesome Instagram plugin to easily display Instagram images on your website. Instagram Gallery is easy to use and you can show photos from the photo-sharing site as a gallery or carousel slider. There are no complex settings to configure and an Instagram username or tag name is enough to create a unique gallery of your precious contents. Create your Instagram gallery through the plugin settings and insert it into posts, pages using the shortcode or in the form of a sidebar widget. Are you using any Instagram plugin on your WordPress blog? Feel free to share your feedback and suggestions through comments.